Laying with your eyes closed is not sleep. Your brain actually changes pattern in brain waves when you go to sleep. You can’t fake sleep. The brain knows. At the time, I started a sleep log for 10 weeks. I averaged 3 hours of sleep a night. Never more than 5 hours of sleep and hardly ever all of it in one chunk. This is serious sleep deprivation. Everyone needs sleep. This recipe for a good night sleep according to the VA would just about guarantee very freaky nightmares for me. The white noise idea actually has some merit and I’m doing a few experiments with this. Bottom line a dark, quiet room is about the worst environment I can sleep in. In all the research I have looked up it either suggests the above environment or medication as to solutions available. I have a few more things that may or may not work. Some suggestions are not conducive to sleeping with someone else. Some of these experiments may need to be done with either the consent of your sleeping partner or in another room. If anyone has other suggestions I would love to grow this list. No where on the sleep pages that I have read does it have suggestions like the ones I’m about to give. This information will be posted under Coping. Sleep log – First suggestion, keep a sleep log for a few weeks. Write down when you go to bed. When you think you went to sleep or the last time you looked at the clock. How many times you woke up and how long it took to go back to sleep. When you finally got up for the day. Also record any naps you have during the day. You notice I didn’t mention anything about nightmares or dreams or anything else. This log is to only track your sleep. It is a good idea to see how much or little sleep you are getting in the first place. Kind of a surveying the damage log. Here is a list I created so far. Some work for me, some do not. Choose and experiment at your own risk. Remember if you sleep with someone else, let them know what you are planning to try. TV ON – yup, I know people that can only sleep with the TV turned on full rip. Late night talk shows can really put some people blissfully to sleep. Music turned on – low or cranked depending on what works – Which music you choose can make a difference. Some is soothing, however some causes anxiety while sleeping, nighttime music may be quite different from day time music. Crickets with ocean music rose rapidly on my hate list. I didn’t know until I tried that I hate the sound of crickets. Overhead light on – Flood the room with light, doesn’t do much for producing you own natural serotonin but it can work wonders at relaxing enough to sleep. This helps because when I wake up from a nightmare I can see where I am and more likely to go back to sleep quickly. Nightlight – These small lights can make a difference for many sleepless people. Some are less than 1/3 of a watt and cost less than a few dollars. Strategically placed they cause a minimum of disruption for anyone else sleeping in the same room. Glow-in-the-dark Stars – This was new to me when I slept in a room with them while on vacation. No electricity what so ever. The stars were stuck on the ceiling. By the time their glowing dimmed the sun was coming up. Aroma therapy – Essential oils were used anciently and today for healing purposes. However, essential oils are very personal. What works for one person may or may not work for someone else. Some oils are very strong and need to be diffused in the air or mixed with coconut oil or some other natural agent to make it comfortable to use. Again this is an area that try what you think might work and record the combinations that seem to induce sleep or staying asleep. A dab of essential oil on a stuffed animal and cuddled in bed is one way to breathe in oils. Stuffies – Stuff animals, toys, teddy bears whatever childhood pleasant memory you might have or buy one. (Yes, I own a stuffed minion after Despicable Me movies became popular, sits by my computer.) Sometimes throwing away a stuff animal that trigger bad memories, helps sleeping at night. Just because you had it since you were a child doesn’t make it a ‘good’ sleep aide. Change rooms – This one I tumbled on by accident. I wanted to sleep with a light on and my husband couldn’t sleep with a light on, so I changed rooms. The change of rooms actually helped. Surprised me. Sleep on a couch – Many jokes are attached with being punished by sleeping on the couch. For me on super ugly nights, it works. The cushions are against my back, I can face outward and keep the light on or off. Sometimes just the move to the couch is enough to put me to sleep. Recliners – Recliners are another substitute to beds when PTSD triggers are attached to a bed. Buying a new bed is another similar possibility. Recliners can also be helpful with sleep apnea and heart burn. Sleep is the highest importance and if sleeping sitting up instead of laying down works then sleep sitting up. Piles of pillows – Two or three bed pillows can turn a regular bed into a sort of recliner. This will sometimes take pressure off my chest and ease feelings of distress almost as well as a recliner. Under covers – I read about some survivors that prefer to sleep under covers including their heads. I can’t stand to have my head cover but I feel more comfortable going to sleep with covers on than off. On top of covers – For some people, under covers has a tied down or suffocating feeling. Use heating or cooling or clothes to have your body at a comfortable temperature to sleep on top of the bed covers. If sleeping with a partner, they may want covers for their half of the bed. Clothes – believe it or not, what you wear to bed can have an impact with how well you sleep. Try different clothes or no clothes to see what works best. I found that night gowns can cause distress but pajamas don’t. Try loose clothes verses tighter fitting clothes to see if that makes any difference while sleeping. Sleeping with someone or alone – Some people enjoy cuddling and feel more secure sleeping with someone. Some people need to sleep alone. Couples need to discuss pros and cons of each. On difficult nights, I often send myself to sleep on the couch so my husband can get some sleep. 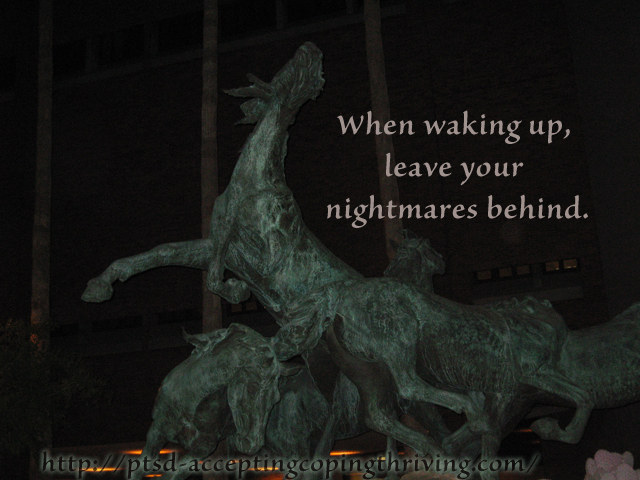 My thrashing back and forth just before waking up from a nightmare can be very disturbing to him. Communication with my spouse is essential to let him know that my trouble sleeping is not about him. Pets – Another living creature, cat, dog, horse, to name a few, can work as therapy when caring for them. Even plants can show a benefit to survivors. PTSD Dog – This information came to me more recently. PTSD dogs are being trained to help people with PTSD while sleeping. One of the dogs duties is to wake up their owner when nightmares take over their sleep. Some dogs do this without training. We had a German Shepherd that seemed to know when to wake me up. A real blessing to me for many years. Most PTSD dogs are specifically trained for vets. Judy – I changed my alarm clock from a buzzing monstrosity to a radio station I like (K-LOVE) or a CD. My children grew up with the mantra, “Don’t wake mother.” My husband was dismayed that no matter how many years we were married he could not touch me to wake me up without a violent reaction. Several years ago, I was in a hospital for a problem with my stomach. On the card that asked to list any other problems I wrote PTSD in big letters on the card. I naively thought that hospital personnel would understand what that meant. Nope. One morning one of the nurses woke me up by touching my arm. I woke up screaming and my heart pounding like a jack hammer. The nurse jumped back as wide eyed as one of my kids that attempted to wake me up. The nurse asked what was wrong with me. I am not terribly brilliant when I am woken up. I mumbled confused, “It’s on the card.” The nurse turned the card over and read the letters. She looked at me with concern in her eyes, “Do you mean now?” REALLY. PTSD doesn’t magically disappear because I was in the hospital. Yes. Now. They made plans to move me right a way to the psychiatric floor but there was no room. So they brought in one of the nurses from that floor to keep on eye on me. Sleeping is rough, waking up can be rougher. Those moments between sleeping and waking when nightmares haven’t been silenced and rational mind isn’t in charge yet is very difficult to maintain a healthy control of reactions. Prepare for waking up as carefully as going to sleep. Check with who you are trying to wake up before attempting to use any of these methods. Warn any one that may attempt to wake you up of the hazards they may encounter. When I go to the hospital now, I carefully explain to the nurses what they need to do to wake me up peacefully. I’ll add a list of possible waking up techniques to the sleep page that may help. As Judy mentioned, music – A favorite radio station, CD or music mix that signals morning and time to get moving. I also want to try the new alarm lights. They slowly turn on, like the sun is rising. Talking – Talking normally and calmly to wake the person without expecting them to take in what you are actually saying. Soothing good mornings, reassuring the sleeper that all is well, and encouraging them to start the day are all possibilities for wake up call. Please, no barking orders, expecting answers, or actual conversation, the brain takes time to transition out of sleep. Turn a light switch on and off – Slowly turn the light off and on. Shop around for an alarm clock that has a sound that doesn’t trigger a violent reaction. Some of the new white noise programs actually have a setting that allows an alarm to get slowly louder. Set the alarm 15 to 20 minutes before you need to actually get up allowing yourself time to wake up before getting up. Develop a stretching routine that starts before getting out of bed. Many nights muscles would be knotted from nightmares and tension. Releasing that tension before getting up improves the morning a little. Create a morning routine that tells your body and your mind it is time to leave the nightmares behind and tackle another day. NO Loud banging type noises. NO Alarms that sound like sirens, horns honking or other noises distressful to the person being woken up. Do NOT Flick the light on and off rapidly. Do NOT Touch the person in any way. If possible, leave your nightmares behind.